Following criticism by House of Fraser and Sports Direct boss, Mike Ashley as his offer to buy Debenhams was snubbed, the department store business announces it has secured funding for its refinancing package. This morning, Debenhams confirmed that it has put in place new facilities with its existing lenders. These provide the group with facilities totalling £200million of new money, including £40million to replace the interim borrowing announced on February 12. Earlier this week, Mike Ashley had slammed Debenhams advisers and was reported as saying they should be “put in prison”, when his offer of a cash bid to buy Debenhams for £61.4million proved fruitless, as the retailer announced it was pressing ahead with its own refinancing plans and a deal that could pave the way to wipe out shareholders, including Mr Ashley’s 30% stake. Announcing the new funding today, Debenhams chairman Terry Duddy said: "We are pleased to have agreed this comprehensive funding package which secures the future of the Debenhams business and provides reassurance for Debenhams' employees, pension holders, suppliers, lenders and other stakeholders. We have also preserved a route for our shareholders to participate in the future of the business, but this requires the support of our major shareholder. "We will now move to the next phase of the restructuring of the business, which includes reducing rents and reshaping our store portfolio, as we have referenced in previous announcements. These actions are necessary to ensure the strongest possible platform to support the business going forward." On March 22, Mr Ashley confirmed Sports Direct was “considering a possible offer” for the share capital of the department store chain not already held by his business. He followed this with plans for a “firm offer” to pay 5p per share for the stock Sports Direct does not already own, equating to £61.4million. It was the latest takeover bid by Mr Ashley, including an attempted boardroom coup and offer of a loan to support the department store business on the condition that he be appointed CEO. Debenhams had originally said or the cash offer, that any offer would be “given due consideration by the board”. However, raised concerns from the outset, stating that any public offer “would not, in itself, address Debenhams' immediate funding requirement”, adding that there were “obvious concerns with the proposal that Mike Ashley becomes CEO of Debenhams given that Sports Direct owns our direct competitor House of Fraser”. The business has always remained clear that it would continue with its plan to obtain the £200million funding required, as outlined in its statement on March 22. Speculating over what route the business would take, it was suggested Debenhams would favour either pre-pack administration, which does not need shareholder approval, or a debt-for-equity swap that would see lenders take control. Mr Ashley said in response: "Now the results of the vote are known and we have also been subsequently advised that the supportive HSBC are no longer part of Debenhams' revolving credit facility, I think that, if there were any justice in the world, the majority of the advisers would be put in prison." Addressing Mr Ashley’s recent proposals, the Debenhams board said today: “The board of Debenhams has also sought to do its utmost to preserve value and optionality for the company's shareholders. The board has received a number of proposals in recent weeks from Sports Direct that have purported to provide a solution to the group's financial challenges. In the board's judgement, none of these have provided or been compatible with a comprehensive solution. 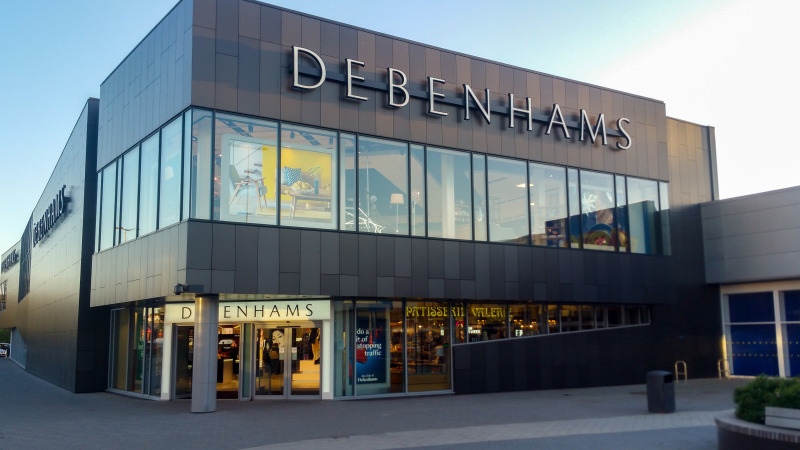 Detailing the refinancing announced this morning, Debenhams explained that the facilities are for £101million and £99million and the company has served a draw down notice for all of the first facility today. Availability of the second facility is subject to one of a number of milestones being reached by April 8, 2019. These milestones include Sports Direct or another shareholder holding 25% or more of the company shares, entering into an agreement with the company and its lenders covering either (i) a firm and binding offer for the company which includes satisfactory arrangements to refinance the group debt that becomes due and payable on a change of control, and provides the group with sufficient working capital; or (ii) cancellation of the request to convene an EGM of the company, a stabilisation agreement with the company and a commitment by Sports Direct to either underwrite a rights issue by the company or provide funding by way of a subordinated debt instrument on terms agreed with the group's lenders and noteholders. If these milestones are not satisfied, the second facility would be available to the group's subsidiaries only upon transfer of those subsidiaries into the ownership of a lender-approved entity. This outcome would ensure the stability and continuing trading of the group's operating subsidiaries, with no disruption to the group's business, customers, employees, pension holders, suppliers or operations. However, it would very likely result in no equity value for the company's current shareholders. Following discussions between the company, the trustees of the Debenhams pension schemes and key pensions stakeholders, agreement has been reached with the trustees to provide enhanced support to the pensions schemes, including increased contributions and enhanced security. The group said it has undertaken a thorough review of its store estate in the context of the current and future retail environment and plans to proceed with a restructuring of the estate that, if approved, will result in a significant overall reduction in the group's rent burden. This is a critical component of the group's restructuring plan, and executing this is in part linked to the provision of the facilities.